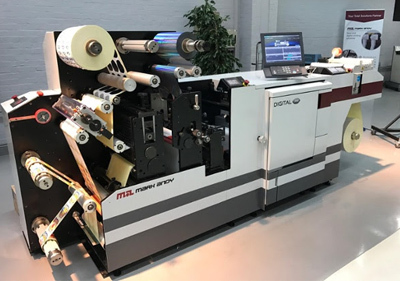 Label and flexible packaging manufacturer, Custom Printed Products has added digital capability to its business through the acquisition of a Mark Andy Digital One. Richard Nicholson, President, Custom Printed Products was first exposed to the inline digital label press in the Fall of 2016 and purchased in October 2016. Digital One is an entry-level digital label press designed for short and micro run prime labels. The press is made up of 4 color dry toner printing process and a multi-function flexo deck for spot colors, laminates, adhesives or varnishes. Unlike many other small footprint digital devices, Digital One provides inline converting and finishing, delivering ready-to-ship label production. Custom Printed Products (CPP) is a longtime industry player based out of Bossier City with nearly 50 years in the business. Nicholson founded the company with his partner Robert Waddell in the back of a transmission garage with a Mark Andy tabletop three color press. Since 1971, they have expanded to multiple locations in Bossier City, Louisiana and Edinburg, Virginia. The company employs over 100 people and runs a fleet of 10 Mark Andy presses, one being the newly installed Digital One. Employees are knowledgeable and maintain an average of 15 years of experience in the printing industry. Nicholson began the search for a digital label press when the company noticed a substantial increase in work that was outsourced. These jobs were shorter runs and had application requirements that were only achievable on a digital device. At Labelexpo Americas 2016, Nicholson and his team attended with the goal of finding a digital label solution that allowed them to bring this work back in-house to meet their evolving business needs. CPP evaluated Digital One against another well-known toner-based digital device and decided to partner with Mark Andy because of the cost-competitiveness the press manufacturer brought to the table. Digital One is built on a pay-as-you print model with no click charges and is offered at an affordable capital investment level. Nicholson and his production team were also impressed with Digital One’s ability to retrofit all of their tooling to the press. Since installation, CPP runs 8,000 to 10,00 feet per day on the digital hybrid machine. The company has a varied book of business and prints a variety of labels ranging from motor oil labels to work for clients in the wine and beer market. The ability to bring digital labels in-house has enabled the company to ensure their customers are receiving the highest quality work at a competitive price. The business reports that the ability to bring in digital work that the company was previously outsourcing has justified the spend on the new press. The company has been able to move short run work they were previously running on a legacy Mark Andy press to Digital One, which provides the ability to fully utilize the full production flexo press. A decision that has proved to be extremely cost effective for the business. With the addition of Digital One, the company is currently running at capacity daily. Custom Printed Products is committed to its mission of providing high-quality labels and flexible packaging that consistently exceeds customers’ expectations, while positioning them for growth into the future.